BELLIN -Carte du Golphe de St.Laurent et Pays Voisins ? BELLIN, J.N. - Carte du Golphe de St.Laurent et Pays Voisins ? Carte du Golphe de St.Laurent et Pays Voisins ? - BELLIN, J.N. Title : Carte du Golphe de St.Laurent et Pays Voisins ?. Size : 8.7 x 14.2 inches. / 22.0 x 36.0 cm. 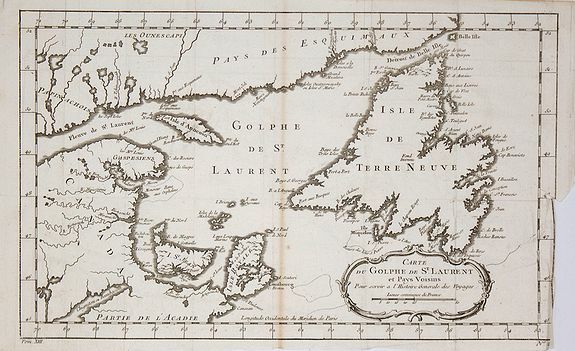 Description :Accurate map depicting the gulf of St. Lawrence and the surrounding area, included the isle of Newfoundland. Jacques Nicolaas Bellin (1703-1772) was one of the most important and proficient French cartographers of the mid-eighteenth century. He was appointed the first Ingenieur Hydrographe de la Marine, and also Official Hydrographer to the French King. Condition : Slight browning along the centerfold. Tear on the right margin and lower part right margin crumpled. Otherwise in mint condition.